Bryn Villa is situated within Llansawel, a rural Carmarthenshire village with a rich history. It is set in the ever beautiful Welsh dairy valleys, with famous, picturesque and memorable places within a few miles. Bryn Villa accommodates up to six people comfortably in three bedrooms, which all boast their own Smart TVs. 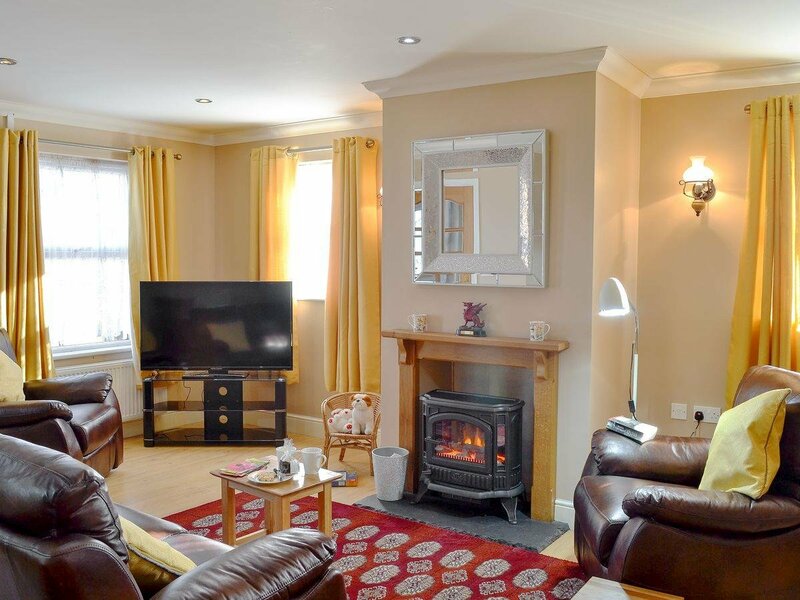 The large and attractive living/dining room has a cosy electric wood burner and double doors through into a spacious and well-equipped kitchen with bar stools at the breakfast island. Having two pubs in the village means you won’t have far to wander when you fancy a drink or a break from cooking. One of the pubs also sells the day to day essentials that you may need. There’s a peaceful walk around the river and also a park in the village with swings, slides and a climbing frame – something younger children are bound to enjoy! The area is a paradise for walkers or cyclists with Abergorlech and Brechfa Forest very nearby. There is a series of signposted walks, or for cycling enthusiasts, there is a beautiful, picturesque forest, with a range of trails for all abilities. This is a fantastic place for all the family to enjoy the thrills of mountain biking. A 10-minute drive will bring you to the fascinating National Trust gold mines of Dolaucothi. These unique gold mines are set amidst wooded hillsides that overlook the beautiful Cothi Valley. 2,000 years ago, the powerful Romans left behind a glimpse of gold-mining methods. The harsh mining environment continued on into the 20th century and now guided tours take you back to experience the conditions of the Roman, Victorian and 1930s underground workings. See and hear the mine machinery or have a go at gold panning and take the opportunity to experience the frustrations of searching for real gold! Less than 3 miles away, set in beautiful hills, at the head of the Talley Lakes, visit the haunting ruins of Talley Abbey. The abbey was unique in Wales in that it was founded for the monastic order of the Premonstratensians, or White Canons. A 20-minute drive will bring you to the Georgian market town of Llandeilo with an array of independent shops, cafés, pubs and restaurants, including an award-winning chocolatier and ice cream shop! The National Trust Dinefwr Park and Newton House near the town are well worth a visit as is Carreg Cennen Castle, also nearby. Visit the National Botanic Garden of Wales with its giant glass dome - perfect whatever the weather, or take the half hour drive to Wales’ oldest town, Carmarthen, where you will find a shopping centre, cinema complex and leisure centre. You can also be at the lovely golden beaches of either Cardigan Bay to the east, or Carmarthenshire to the south, in well under an hour. Beach 25 miles. Shop 30 yards, pub and restaurant 20 yards. Be the first one to tell us about your rental experience while staying at Bryn Villa. Let us know if the listing matched your expectations. You can share your comments about the location, property owner/manager and all the unique features that made your stay a memorable one.